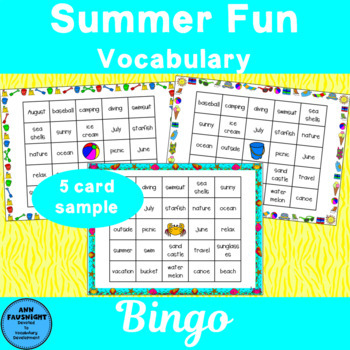 Summer Vocabulary Bingo Fun Freebie! 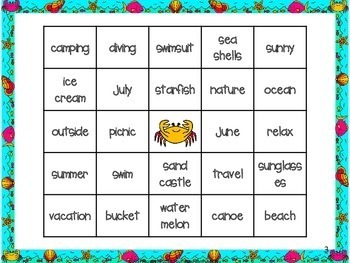 Practice reading some summer vocabulary while having fun playing bingo! 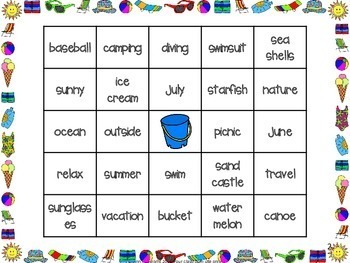 A total of 25 different cards in both color and BW are included in this game making it useful for summer day camps or other summertime groups. This would also be a great activity to welcome students back on the first day of school. 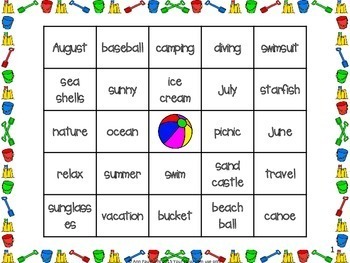 Prepare: Print out different BINGO cards for each child plus the call sheet. Cut apart the call sheet and put the squares into a box, bag, or bowl.Distribute: Hand out one Bingo card to each child (25 different cards available). Each child also needs 16 – 20 markers. The center square picture represents a “free space”. It should be covered before the game begins. The children will then place a marker (optional squares included),pennies, candies, fun foam pieces or something fun on the called word if it is on their card. Call: The caller should pull out one word, read it, or describe it for the children to figure out.Winning: Once a predetermined pattern (row, line, diagonal, corners, etc.) is covered on a card, the child with that card calls out BINGO.